The story of MCA and its unrivaled influence on the culture and business of entertainment under perhaps the most powerful man about whom most Americans know nothing. Following MCA founder Jules Styne and his band-booking business from Chicago to Hollywood in the mid-1920s, New Yorker staff writer Bruck (The Predators’ Ball, 1988, etc.) shapes the conduit opened between Tinseltown and Styne’s sub-rosa associates, the Chicago mob. Roots on the rough side would make MCA “too aggressive, too smart, and too street-wise” for most contenders in years to come, she notes. 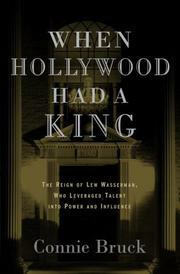 But it was the hiring 12 years later of a former Cleveland movie usher named Lou (later self-amended to Lew) Wasserman that put what was by then a multitalent agency on the road to forging Hollywood history and, for decades, uncontested dominion. Who knew there were so many deals of the century? But Wasserman sat in on them all: breaking the back of the old studio-mogul empire by getting Jimmy Stewart the first star’s piece-of-the-action deal from a house that didn’t have cash up front; turning MCA into a production outfit that rushed in to “save” nascent TV networks then, in no time, dictating entire program lineups. He did business with presidents too: Lew dined intimately with LBJ at the White House; in 1950 he had turned to his client and Screen Actors Guild president Ronald Reagan to push a touchy labor situation MCA’s way, then, 30 years later, just as handily got “Ronnie,” as US President, to call off the FCC, a supposedly independent agency, from enforcing nonsyndication rules against TV production firms. Eulogies in June 2002, proclaiming him a pillar of strength, wisdom, and integrity, Bruck avers, skirted a broader truth. A monumental piece of work, stuffed to the gills with both clean and dirty secrets, certain to be de rigueur poolside reading in Beverly Hills this summer.